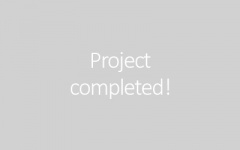 Bottomline Technologies powers mission critical business transactions.  They help their customers optimise financially oriented operations and build deeper customer and partner relationships. 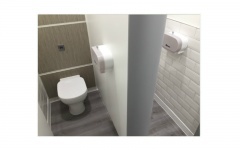 Bottomline are completing the first phase of their project... some toilets! 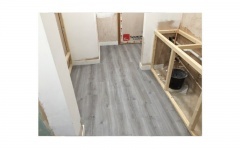 Take a look through our timeline to see how the project is coming along! 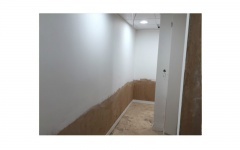 The toilets looking rather tired before the works begin! 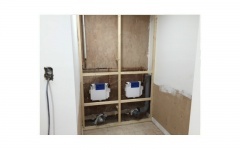 The toilets looking rather tired before the work begin! 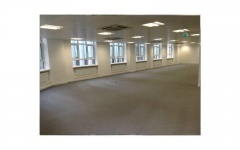 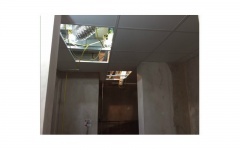 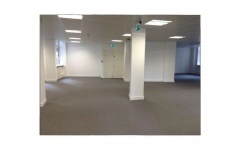 Electrical isolation have been completed and the ceiling grid is stripped out and temporary lighting installed. 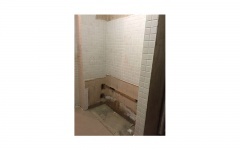 All of the furniture is removed from the Gents and tiles stripped from the floor and walls. 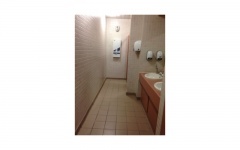 The toilet pans and cubicles are removed from the ladies. 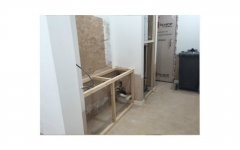 The basins and vanity unit have been removed form the ladies ready for the tiles to be stripped. 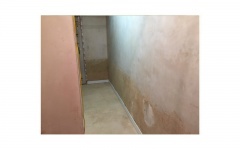 Tiles have been stripped off in the ladies and the wall cleaned back. 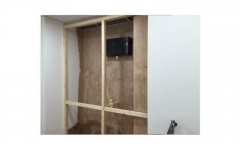 Plastering is complete in the gents. 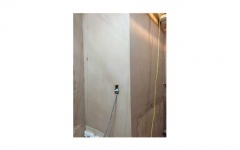 Plastering in complete in the gents. 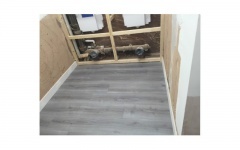 The skirting boards have been installed in the ladies toilets. 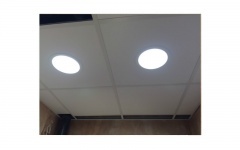 Ceiling grid and tiles are being installed in the ladies. 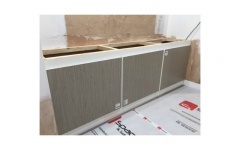 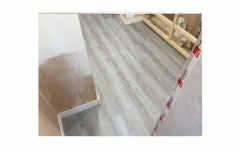 Skirting boards in the men's are being installed. 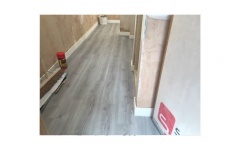 The skirting boards have been installed in the men's. 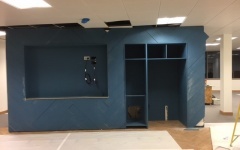 Ceiling grids and tiles are installed in the men's. 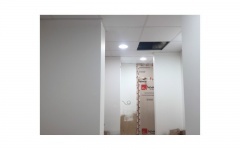 The lights are installed into the new ceiling grid. 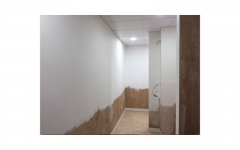 Paint is going on the walls in the ladies, starting to look a lot cleaner and newer! 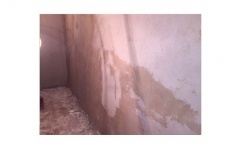 Gents decorated with the first coats of paint. 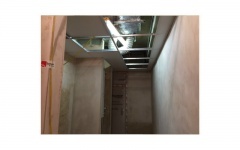 First Fix framework for duct panel in Gents. 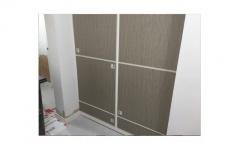 First fix framework for duct panel in Ladies. 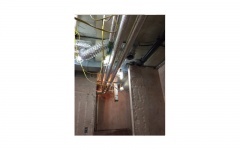 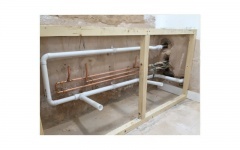 First fix plumbing for urinals in the Male toilets. 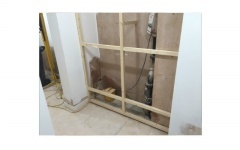 First fix plumbing under the sinks in male toilets. 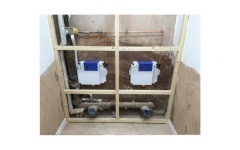 First fix plumbing for male toilets. 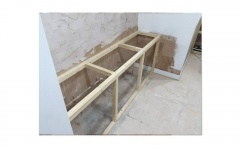 First fix plumbing under the sink in female toilets. 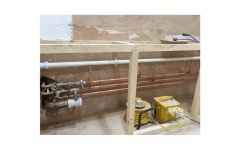 First fix plumbing for female toilets. 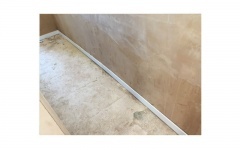 Latex laid in female toilets. 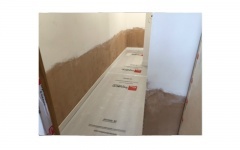 Latex laid in male toilets. 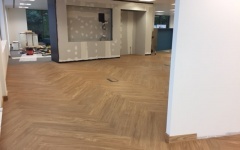 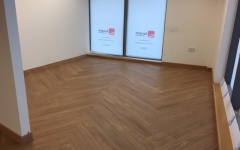 The flooring has been fitted. 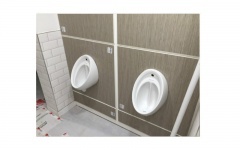 Duct panel with flash gap at urinals. 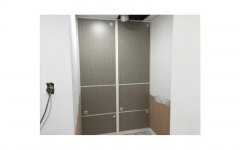 Duct panel with flash gap at toilets. 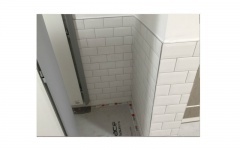 Duct panel with flash gap at sinks. 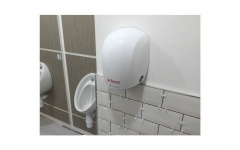 Hand dryer is installed in the new-almost-finished toilets. 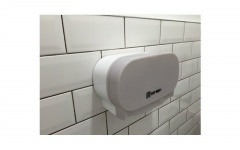 Toilet paper dispensers have been installed. 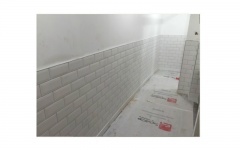 The tiling is now complete in the toilets. 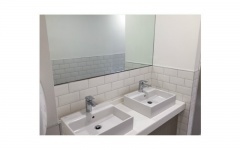 The sinks and mirror has been installed. 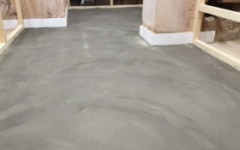 Looks lovely! 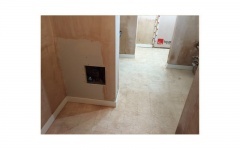 Phase 1 of this job is now finished... straight onto phase 2. 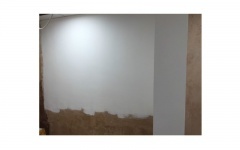 Demo is complete and walls have been plastered. 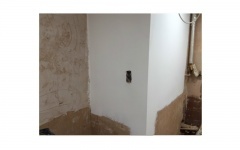 Demo is complete and the walls are being plastered. 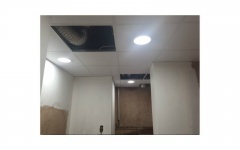 New ceiling grid and lights have been installed to both the gents and ladies. 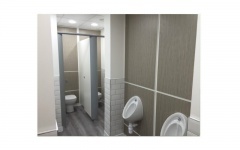 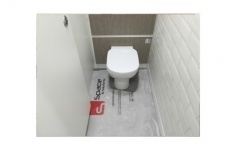 Skirting has been fixed to the male toilets. 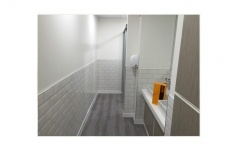 Gents walls have had a lick of paint. 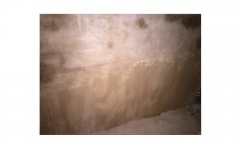 Females have had been painted. 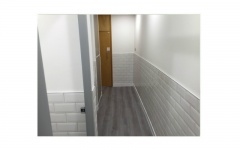 Female toilets have been painted white. 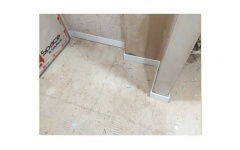 Baton has been fixed as part of the 1st fix duct paneling in the gents. 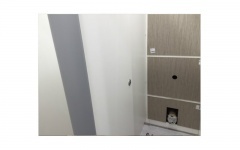 Baton has been fixed as part of the first fix duct paneling in the females. 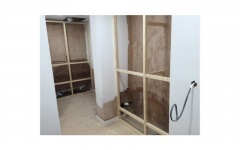 First fix plumbing as the toilets begin to take shape in the females. 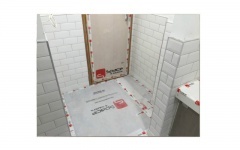 Floor laid, protection now going down in the ladies. 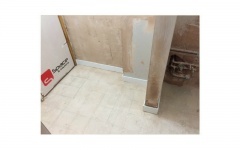 Floor is laid in the gents. 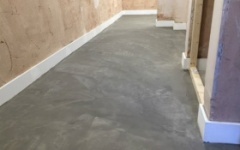 The floor has been laid in the gents. 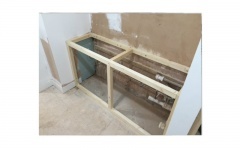 Second fix duct panel, base for the sinks in the gents prepared. 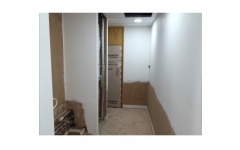 Second fix duct panel, toilet cubicles in the gents have been put up. 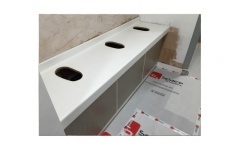 Second fix duct panel, urinals ready to be installed. 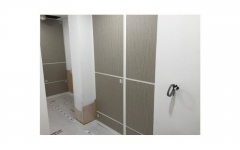 Second fix duct panel, cubicles in the ladies have been erected. 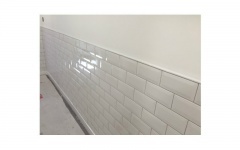 Tiling has been completed in the Gents. 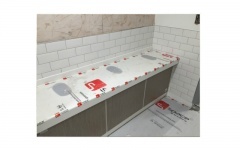 The tiling is complete in the Gents. 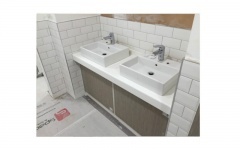 Tiling in the Gents is completed. 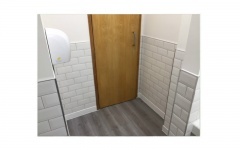 Tiling has been completed in the Ladies. 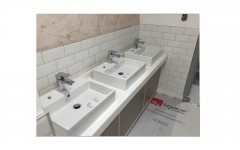 2nd Fix plumbing complete and sinks connected up in the ladies. 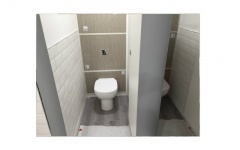 2nd fix plumbing complete and toilets connected in the ladies. 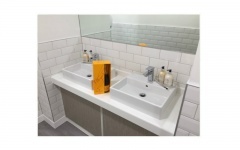 Sinks have been connected in the gents. 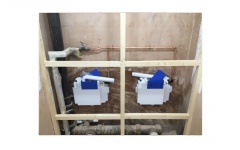 Urinals ready to be plumbed in for final fix. 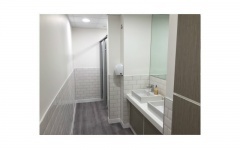 Toilets have been connected in the gents. 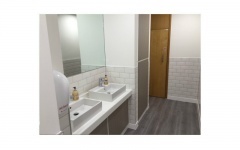 Bottomline's toilets are now complete!